Workers’ rights was always a hallmark of Lynda Tabuya’s campaign in the lead up to the General Election. 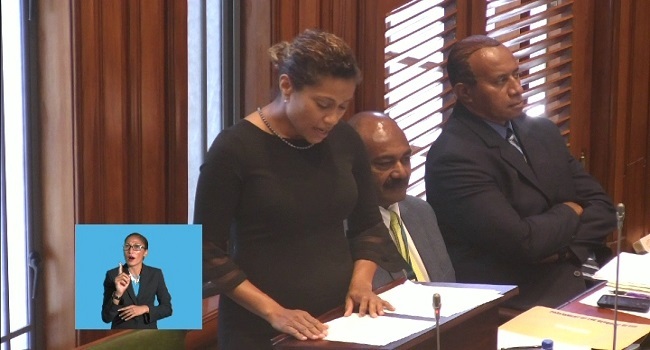 As part of her maiden speech yesterday in Parliament, she reiterated the importance of fighting poverty and working towards a minimum wage of four dollars for unskilled workers. The Opposition Whip also telling the House that while she was disheartened by her party’s loss in the elections, in the end it is not about any single party, rather the entire the country that needs to win. Tabuya calling for a bipartisan approach by both sides of the house that reflects the President’s hope of bipartisanship, one she says they need to take a step further and work together on issues with real results.